With the power of Ratebeer.com behind it, International IPA Day is the world's largest celebration of craft beer. With the power of the Internet and social media, it is starting to get some traction. “On Thursday August 4th, craft beer drinkers across the social sphere and across the globe will raise pints in a collective toast to one of craft beer’s most iconic styles: the India Pale Ale. This celebrated style represents the pinnacle of brewing innovation with its broad spectrum of diverse brands, subcategories, and regional flavor variations – making it the perfect style to galvanize the craft beer’s social voice. To participate, share your photos, videos, blog posts, tasting notes, recipes, thoughts with the world on Twitter Facebook, YouTube, WordPress, RateBeer, Foursquare, Gowalla, Yelp, Untappd or any other social media platforms you may use. 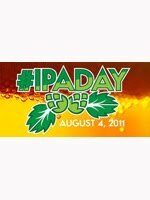 Use the hashtag #IPADay in all of your posts and then see what others are saying by searching the hashtag on google, twitter or other social media resources. Participants are also encouraged to organize “real-life” #IPADay events your local brewery, brewpub, restaurant, bar, home, or office. Share your events at RateBeer.com"
Be sure to support your local brewer and pub and enjoy a wonderful IPA! Let us know what you are enjoying today in the comments section. Thinking about a cold Dogfish 60 Minute I have waiting in the fridge. Can I go home early to celebrate the holiday for religious reasons? In Beer I Trust!